It's so good to be home this morning although, I'm already missing the new friends I made at The Haven Conference in Atlanta. I had a fabulous time and I can't wait to tell you about it. I'll be busy catching up with clients and returning emails for a few days. Then, I'll share the details of my amazing Haven adventure. Along with my crazy travel schedule this month, I'm also in the process of updating the blog. This includes updating my home tour. I'll be posting the spaces as I move along through my home room by room. This space recently went from the ugliest corner of our home to one of my favorite rooms. Using paint, attractive merchandise, vintage elements, simple DIY projects and organization the space was completely transformed. 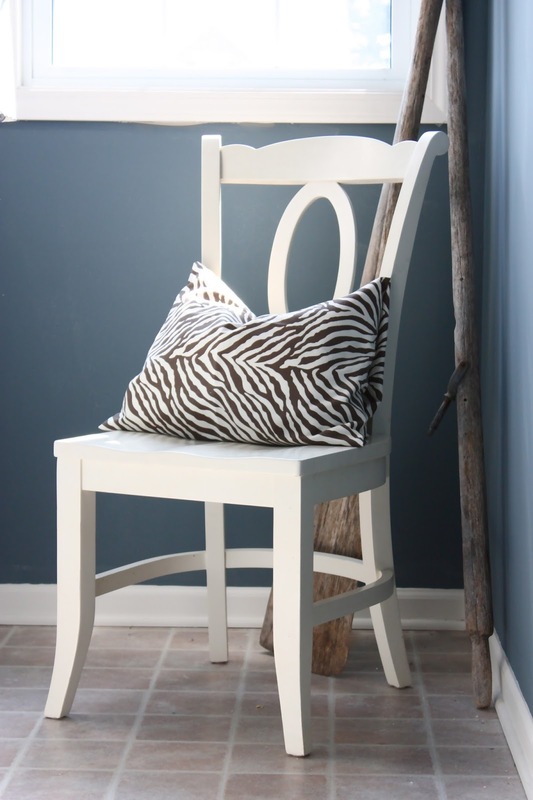 The new blue, brown and warm white color palette was inspired by an outfit I found on Pinterest. 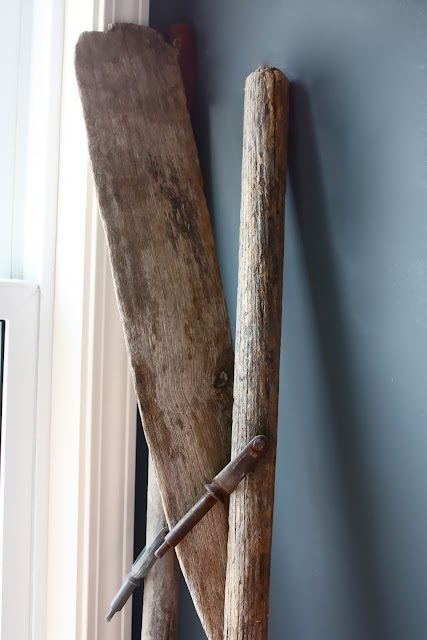 Vintage oars, driftwood and coastal inspired art gave the space a nautical vibe. Crisp contrast between blue and white is grounded with dark brown accents. A wire utility rack was removed to make way for semi custom built-in shelves. This was by far the easiest DIY project ever. 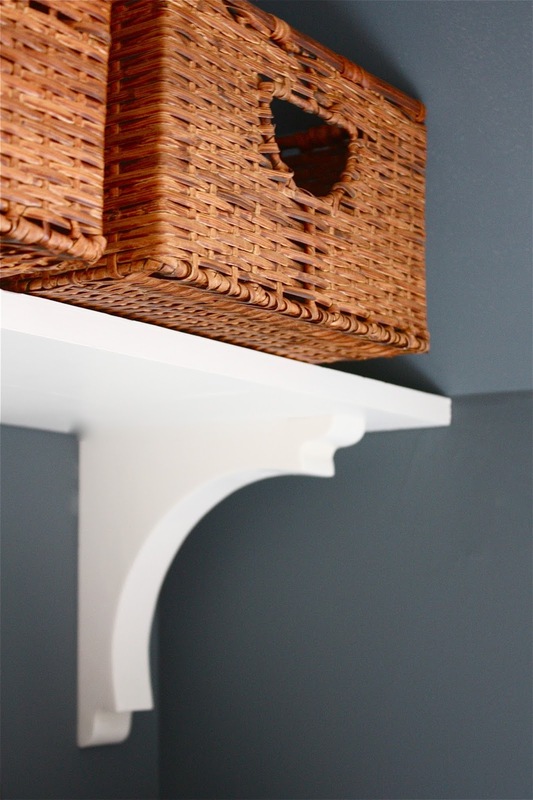 Brackets and pine boards were painted soft white and styled with art and uber functional storage baskets from Ballard Designs. Full length drapery was used to hide the ugly sink area. The fabric I chose for the drape was a Robert Waite tablecloth from TJ Maxx. I also made a coordinating faux roman shade for the window. Beautiful wicker baskets hold dirty laundry and double as pretty natural textured accents. 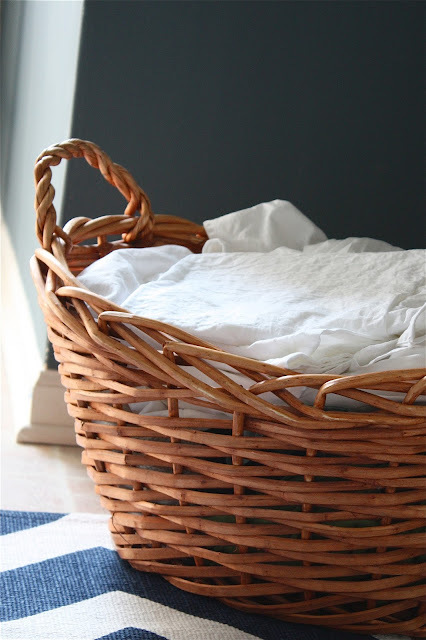 One of our extra dining chairs provides a place to sit while folding clothes. 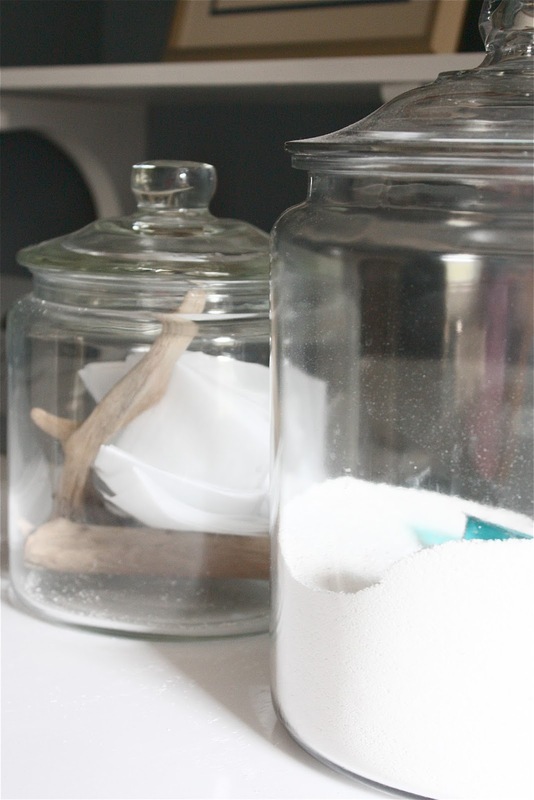 Clear glass jars hold laundry soap and dryer sheets. I dropped in a few pieces of driftwood that have sentimental meaning. These pieces were found on a walk I took with my Dad shortly before he passed away. 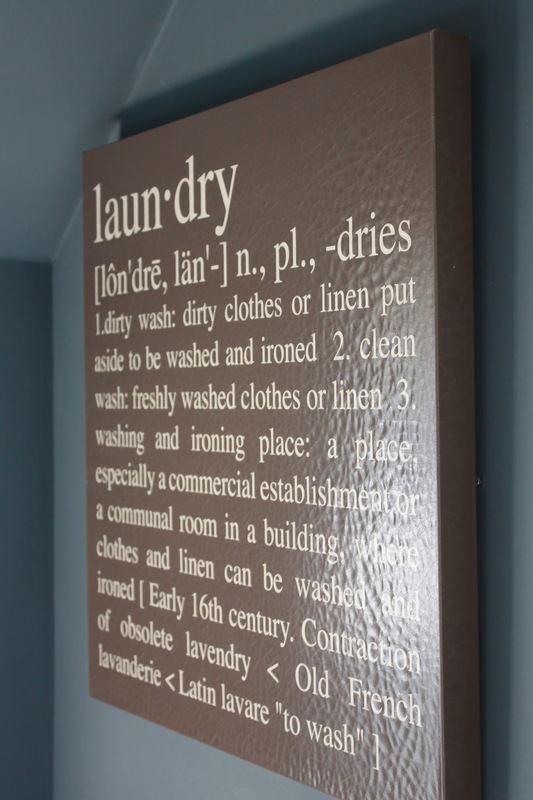 My favorite element of the new laundry room is hands down, the drying rack from Ballard Designs. Prior to having a drying rack we used our stairway balcony that overlooks the foyer to air dry clothes. This piece is not only functional and saves our guests from being greeted by our unmentionables, but it is absolutely gorgeous. 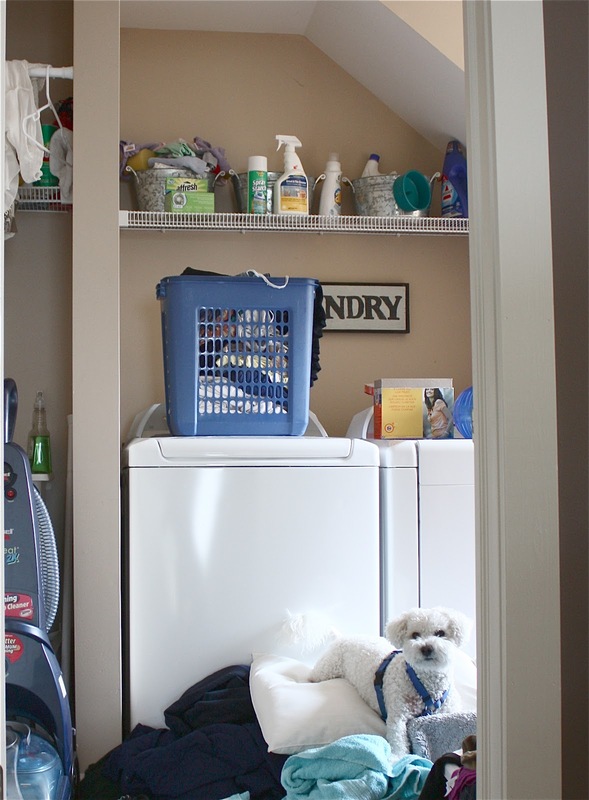 Before this makeover, the door to our laundry room remained closed at all times. I'm so happy with the way this room turned out that I purposely leave the door open. Even when there are piles of laundry. To read more on how this design came to life, click here. 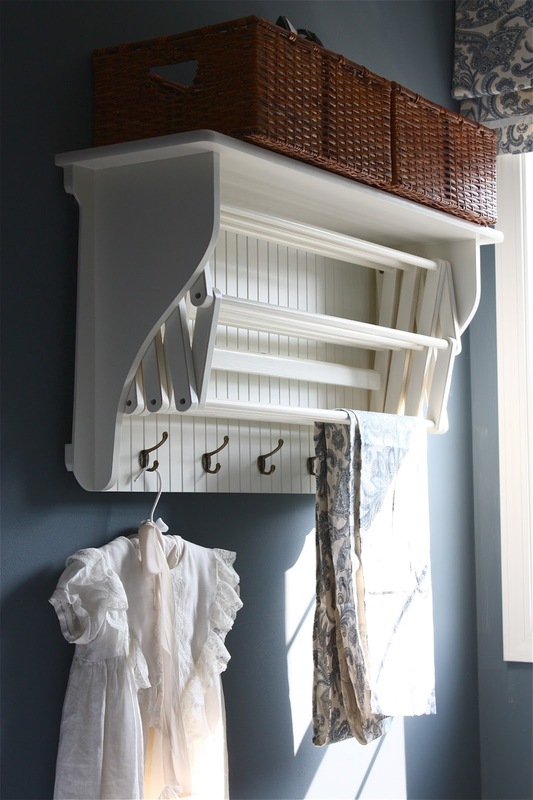 Laundry Room Paint~ Sherwin Williams "Storm Cloud"
Hallway Paint~ Ralph Lauren "Brown Fox"
This is just so gorgeous and I love the blues and wickers with the crisp whites! Gorgeous. Love seeing your laundry room again, Sarah (the wall color is fabulous)! And, thanks for such a great session at Haven ... I really enjoyed it! Thanks, Sarah! Well, if you were nervous, you couldn't tell WHATsoever ... you're a pro and am sure you'll be inspiring us yet again at the next Haven! It was sooo good meeting you! and Im glad we had some time to chat between all the crazy! It looks wonderful....love the drying rack! Looks great, Sarah! Love the wall color. Wow! what a wonderful transformation! Love your color pallet and the elements you used. I think that drying rack is a perfect element for the laundry room. I will have to check that out for my laundry room.